Poll: Should Gerry Adams open up about his past? Have your say in today’s poll on Sinn Féin’s election candidate for Louth. FIANNA FÁIL’S MICHEÁL MARTIN has called on Gerry Adams to open up about his past, saying the Sinn Féin leader cannot really talk about truth, honesty and transparency, Newstalk reports. He said Adams’s words about transparency “jars very much with his own position on the past”, and referred to Martin McGuinness’s openness about his former IRA membership. Last night, Martin and Adams sparred over their different positions on Ireland’s bailout deal. When Adams broached the issue of financial and political fraud, Martin interrupted and said Adams had no right to talk about fraud given the “baggage” of his past. Adams said he had every right to say that there was “fraud in there” and it needs to be weeded out. Do you agree that Adams, who is running as Sinn Féin’s candidate in Louth for the elections, needs to discuss the “baggage” of his past? 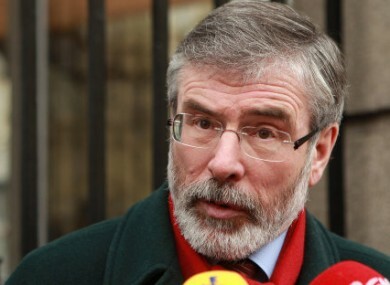 Email “Poll: Should Gerry Adams open up about his past?”. Feedback on “Poll: Should Gerry Adams open up about his past?”.